Bullards Norwich Dry Gin is a popular Gin available from 31dover.com in 70cl to buy online. Visit 31dover.com for the best price for 70cl of Bullards Norwich Dry Gin or compare prices on our other Gin products. Bullards Norwich Dry Gin is distilled with Tonka Beans and 9 other botanicals, smooth enough to be drunk over ice. Bullards Norwich Dry Gin is currently the only Gin Distillery to be found within the county of Norfolk. Naturally dry as its juniper led with coriander and cardamom give off subtle notes. At the heart of the Gin, Tonka beans provide a complex sweetness and smooth finish with a resemblance to vanilla and marzipan. This premium Gin is smooth enough to be drunk over ice or can be complimented with a premium tonic. Orange peel to garnish which in turn should pin point the citrus that runs throughout. Where to buy Bullards Norwich Dry Gin ? Bullards Norwich Dry Gin Supermarkets & Stockists. 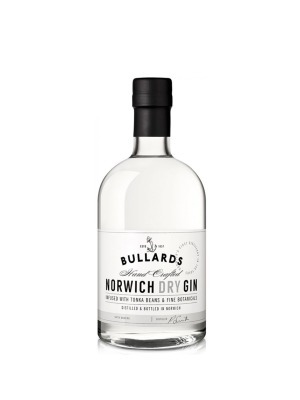 You can buy Bullards Norwich Dry Gin online in most retailers and find it in the Gin aisle in supermarkets but we found the best deals online for Bullards Norwich Dry Gin in 31dover.com, TheDrinkShop, and others. Compare the current price of Bullards Norwich Dry Gin in 70cl size in the table of offers below. Simply click on the button to order Bullards Norwich Dry Gin online now.